Blackpink proved its global influence on the red carpet of New York Fashion Week. 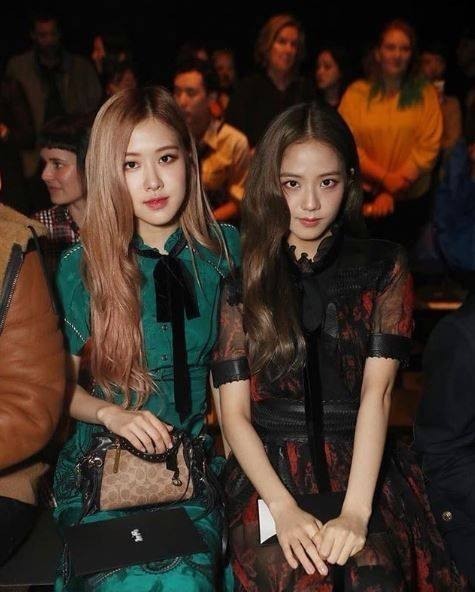 Three Blackpink members, Jisoo, Lisa and Rose, all known for their incredible fashion sense, were part of this year’s star-studded event, which kicked off Sept. 6 in New York. Of course, the week of fun always entails hobnobbing with high-profile celebrities and taking amazing backstage photos, and the girls were spotted with some of the world’s biggest stars. On Tuesday, Rose and Jisoo posed for photos with Selena Gomez while attending Coach’s Spring 2019 show at Pier 94. In the photos, Gomez, clad in a metallic gold minidress, is sandwiched between the two K-pop stars, who also opted for glamorous dresses. Rose sported a teal dress embellished with a black velvet ribbon in front and beige high heels, while Jisoo wore a stylish lacy red and black dress and long black boots. Both completed their looks with uniquely patterned Coach bags. The girls were also spotted hanging out with Japanese model Kiko Mizuhara. Lisa, the band’s Thai member, also grabbed our attention at Michael Kors’ Spring 2019 collection show at Pier 17, where she flaunted her fashion sense in a sleek red polka-dotted dress. She paired the stunning dress with black ankle-length boots and a rose-patterned tote bag. Blackpink will hold its first Seoul concert, titled “In Your Area,” Nov. 10-11 at the Olympic Gymnastics Arena.